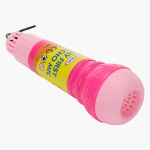 Make your darling feel like a superstar as you get her this adorable echo microphone toy. This helps to increase the child's self-confidence and it develops an interest in music and singing. It keeps the kid engaged and entertained for the whole long day.